How do you choose a rug? If you are like me-- it has to do with design and function. A rug provides texture, warmth and great details to any room. 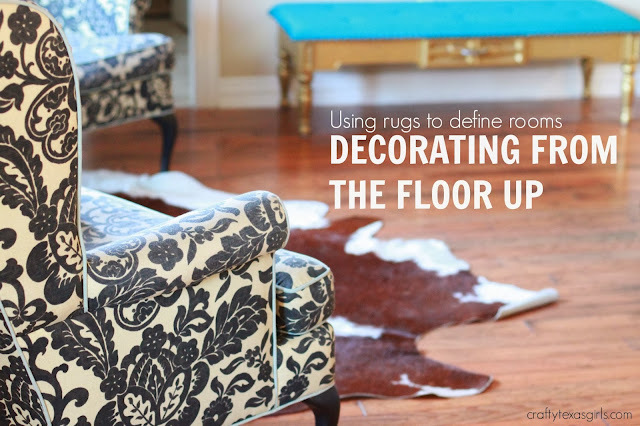 If decorating your home starts from the floor up, then a rug is where to start. My house has an open floor plan, so the rugs help to separate the rooms and give each space a distinct feel. They coordinate with the overall style of my home, but they are all uniquely different. My shag rug in the family room was a fairly recent purchase from Home Goods. The thick carpet is soft and makes the perfect surface for snuggling in front of the fire or for the girls to lounge on while they watch tv. 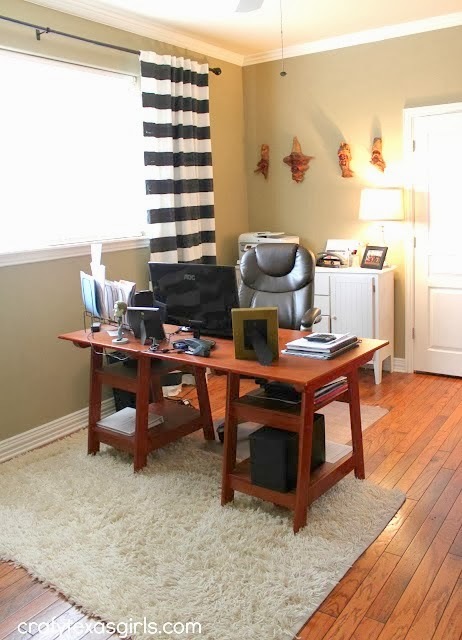 In the office is another shag style rug- but more of a 'gorilla shag' with longer fibers. It adds softness and warmth to my husband's work space. This rug is from Ikea. In the sitting area (formerly our breakfast nook) I added something a little different. A cowhide rug. It is also from Ikea. 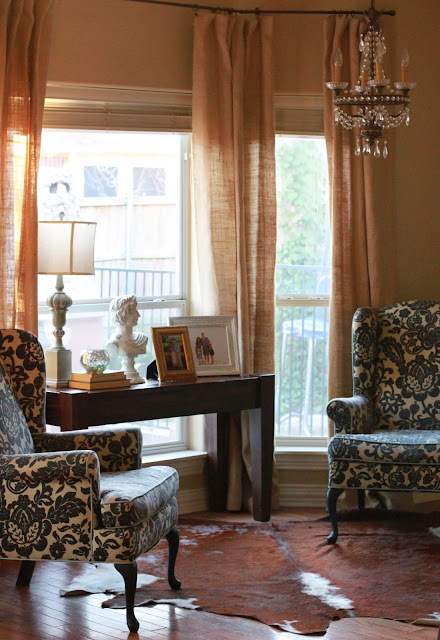 I think it is a great contrast to the formal style of the chandelier and wing back chairs. And surpisingly, a cow hide is easy to care for. Finally, in my dining room, I have a sisal rug from Ballards. I like the subtle geometric design and texture. 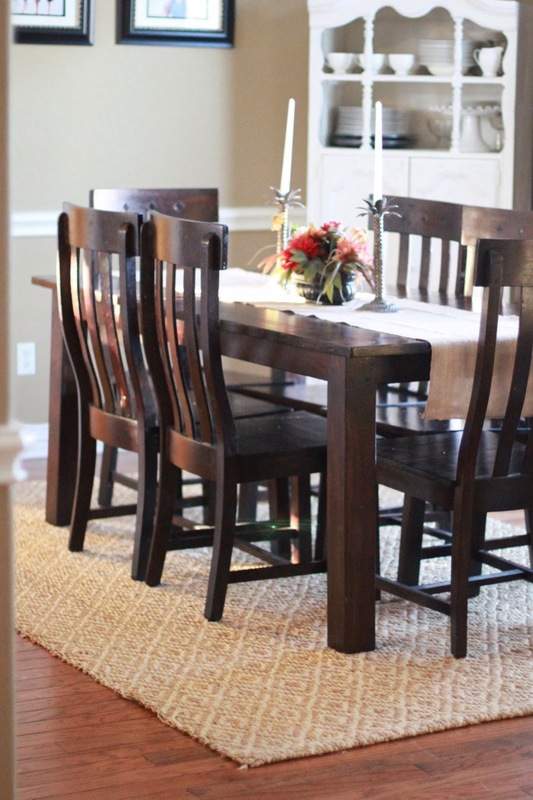 It is a great neutral rug for most any room. What is your favorite style of rug? Back in September I traveled to NYC as part of the Miele Pure Air Blog Campaign. Over the next few months I will be sharing my experiences with my Miele vacuum. I was selected for this opportunity as a member of Clever Girls Collective and the content and opinions expressed here are all my own.